Hello. 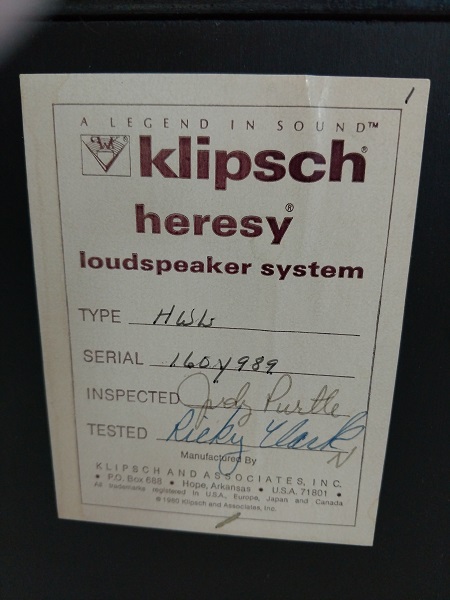 I googled "how much are Klipsch speakers worth" and low and behold I found there is a whole community (a big one it looks like) of Klipsch aficionados. I am impressed. 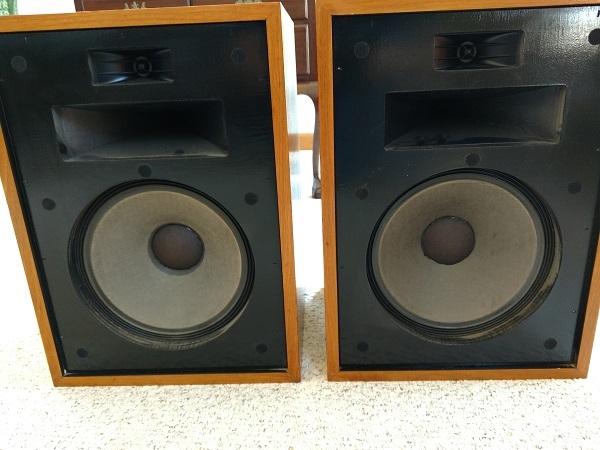 I bought a pair of HWLs in 1983 (I think) when I had more money than I knew what to do with. And I always loved stereo equipment. Most teenage guys had the Farrah Fawcett poster in her red swim suit. I had pictures that I'd cut out of magazines of Nakamichi, Bose, Klipsch, etc. equipment. 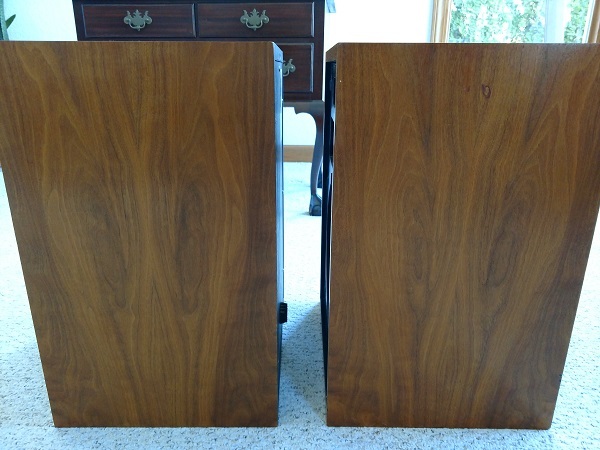 I still love the sound of music, but my wife wants me to sell my pair (of speakers). They still sound as good as always. There are some surface scratches, particularly the bottoms. But the fronts, backs, tops, and sides are in pretty decent shape. I can only load 2MB worth of pics, so I'll start with these two. If someone is interested, I can post more. Oh, and if it matters, the backs have never been opened and the serial numbers are sequential. I would also love to know what you all think these might be worth, even if there's no buyer her. That way I could try Craigslist or eBay. I think those are some of the best looking H1's I've ever seen. I'm impressed. I am actually in the market for some H1. 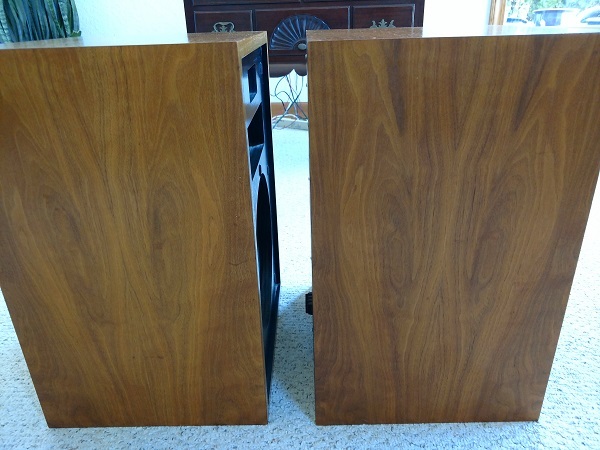 I am hoping to find a dinged up pair and do an exotic veneer but these would be a grab asap and plug in if local to me in the Carolinas. Based on my decent market knowledge, a pair like that could bring $800-900 if you wait out for a buyer and easily $700 within a few days of listing. Wow thanks guys. I did not realize these would be that great. I'll post some more pics. I'm in Missouri, but I guess I could ship them as well. Here is top and bottom. Bottom has the worst scratches. 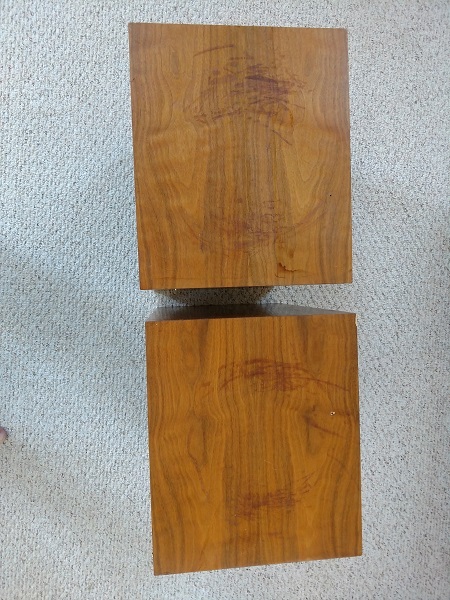 There is also some wood stain or something on the bottom corner. Looks like some finish correction on the top there? I'd say between $500 and $600 - but a lot of that depends on the market in your area and how long you're wanting to sit on them. Could always list them at $1000 and just tell the wife "no one is buying them"
Lastly, here is the front, less the screen and one of the serial number tags. The other tag is 160y988. I've only put lemon oil on them since I bought them. 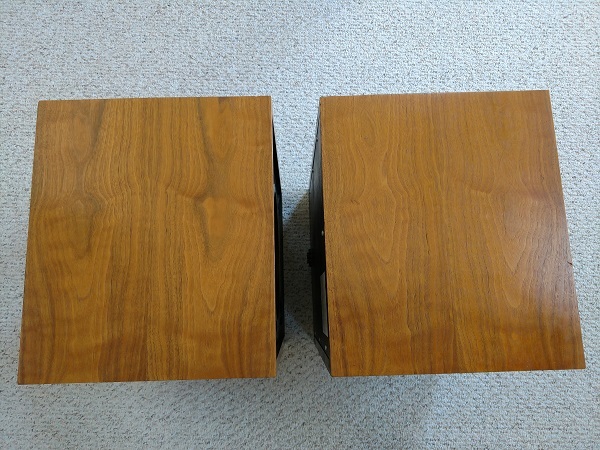 I treated the bottoms today with Old English scratch cover for light woods. Haha about the $1000 listing. And I could sit on them a month or two if no one bites at a higher price. Thanks for the input and making me laugh. And one more blemish to point out, in case someone here wants to buy them: On the right hand side of one of them, there is a small gouge about 3" from the top. It also got some scratch remover on it. 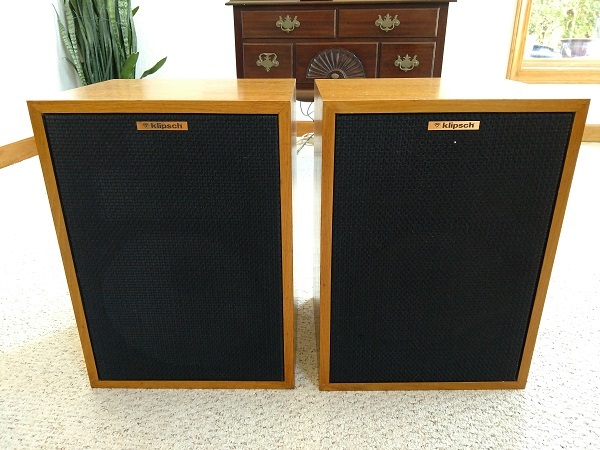 Very nice speakers, I would think $500 for Gen 1 in that good of shape. I just picked up a pair of mint Birch Raw Heresy I for $400 delivered so that is what I am basing it on. You can list them for whatever you like though, there will surely be buyers out there for more than my posted price. GLWS or have fun keeping them. Win win! You've had these for thirty five years and they still look like new. 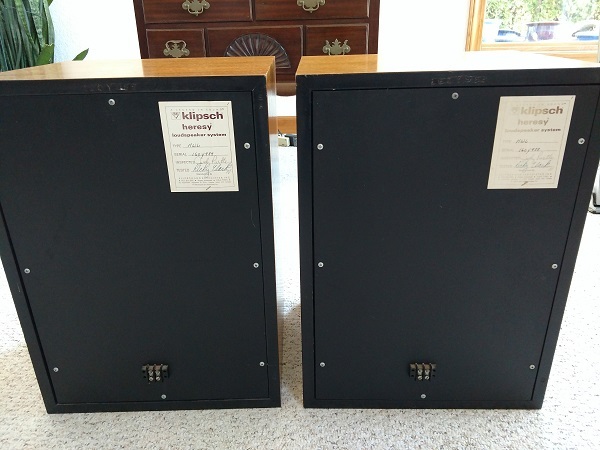 I think you should keep them and share your thoughts with the Klipsch community. You know, you may be right. I've had these 2 playing "surround sound duty" while my Bose held the front row seats. When I made these my front force to make sure they were good for this post, and to clean them up, I was really amazed by the breadth of sonic force the exuded. They are just so big, my wife thinks they look "two thousand and late". Tell her you want to replace them with Klipschorns or Jubilees. so are they still for sale? Sorry for the tardy response. I have been on the road and had not checked back here. Yes, they are. And just to clarify, the only thing I've done to the wood is rub in some Olde English scratch cover. Are you in the St. Louis area? Yes, in Washington, MO. Where are you? I live just outside of Springfield, IL. Just passed by Washington a couple of weeks ago on I-44 on my way to pick up a pair of Khorns near Springfield, MO.